The PU-60 quick release plate for Benro New generation B-1, J1 Ballhead. The PU-60 Universal Quick Release System has been designed to be compatible with other brand quick release systems. Suitable for most ball heads. Built with excellent materials, offering outstanding quality. Width: 38mm (universal width of Arca-Swiss Standard QR plates). 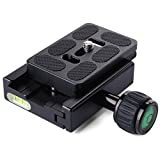 All Arca-Swiss standard quick release plates, including Benro / Arca Swiss / Acratech / Kirk / Wimberley / Gitzo / Manfrotto and etc. This entry was posted in Discount Photography and tagged Adapter, Arca, Ball, Ballhead, BENRO, Camera, Clamp, DC463, Head, Manfrotto, Metal, Plate, Quick, Release, Swiss, Tripod, XCSOURCE® by Ball Photo. Bookmark the permalink.